Imports to the EU of steel fasteners previously subject to anti-dumping measures increased sharply in May. However, imports from many other Asian sources also increased significantly and the Chinese increase follows seven months during which imports flat-lined or declined. 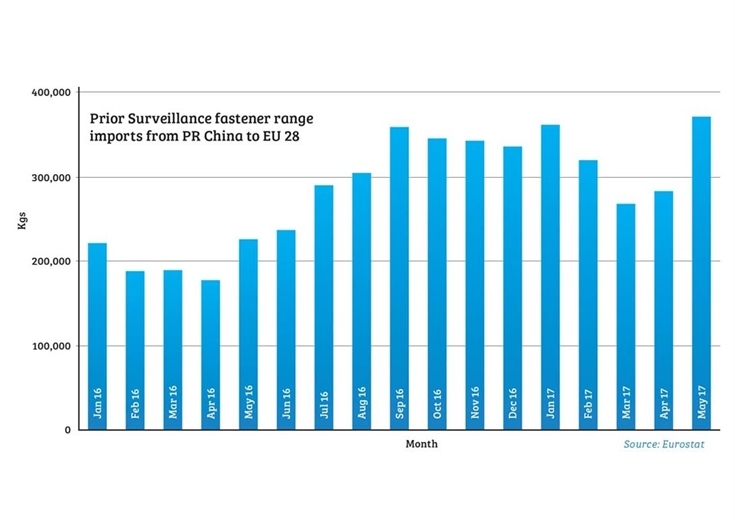 Eurostat data shows that EU 28 imports from China, of the range of steel fasteners subject to prior surveillance import licensing, increased by 31% month-on-month in May, reversing a three month decline. From April through to September 2016 imports had grown rapidly before peaking and flat-lining at a lower level for the rest of the year. January imports reached similar levels to September but this increase can reasonably be interpreted as the normal post-Christmas catch up, boosted by an earlier than usual Chinese New Year. In February import tonnage fell, continuing to fall in March, and increasing only slightly in April. Looking at data for other Asian sources, imports of the same range from India also increased by around 30% in May, and imports from Taiwan increased 17%. Imports from Turkey, Vietnam and Malaysia also recorded increases. May 2017 imports from China equated to 49% of the monthly average during 2007, the year on which previous anti-dumping measures were based. Considering the last available 12 months of Eurostat data, during which the anti-dumping duties were not applicable, Chinese imports equate to 44% of 2007 full year volumes. While imports from China have unquestionably increased since the removal of the anti-dumping measures, there has not been the clear-cut escalation that was anticipated. A number of factors contribute to the slower growth. Volume fastener importers have clearly been cautious about shifting purchases to China, concerned that a new anti-dumping investigation might be initiated. Many have carefully retained relationships with other source countries, which no doubt have worked hard to retain important business, and several have a definite policy to limit exposure to China. The situation, however, is more complex than that. Steel material costs in China have been extremely volatile, with wire rod costs rising very sharply in Quarter 4 2016 and again over the last few months. This closes the cost differential, particularly on higher grade fasteners, with other source countries – notably Taiwan where fastener manufacturers hold greater wire inventory and have scheduled supply contracts, ironing out short-term volatility. In contrast many Chinese factories only source wire when they have obtained an order or hold relatively little inventory because of tight cash flow. As a result prices to EU importers are far more volatile, with shorter quotation validity and at times outright refusals to supply, for fear of producing at a loss. These effects have been compounded by the strengthening of the RMB against the US Dollar. Chinese government policies to reduce air pollution are also directly and indirectly affecting fastener factories. The elimination of 100 million tonnes of low grade steel capacity producing mainly rebar for construction has increased long products prices, as more modern mills re-enter the rebar market at more attractive price levels. Most recently, zinc plating plants in provinces around Shanghai are reported to have been closed by government environmental inspectors and many fastener factories have also suspended or substantially curtailed production for fear of attracting the inspectors’ attention. That all adds up to significant levels of uncertainty when dealing with Chinese fastener factories. The EU and the European Industrial Fastener Institute (EIFI) remain tight-lipped about the prospect of a new anti-dumping complaint – although the EIFI is obviously active in monitoring the situation and building the case for renewed duties. On the other hand, the Commission – having suffered four reverses at the WTO dispute body over fastener anti-dumping measures – is clearly cautious about taking on China over fasteners, presumably wanting to see conclusive evidence of a resurgent trend of damaging imports. That makes the Eurostat data from June and onwards of critical importance.